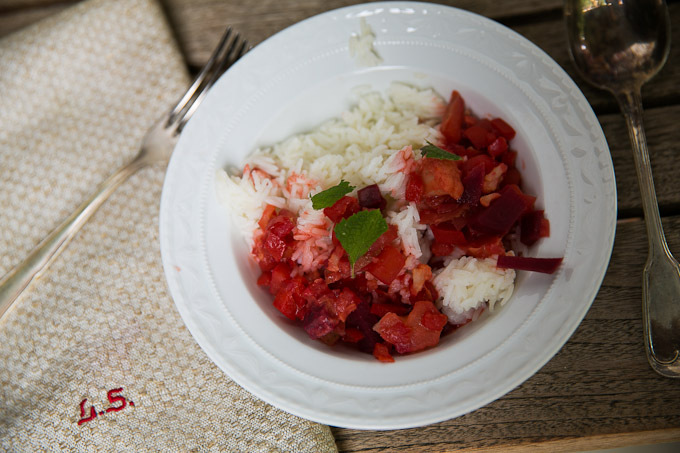 The preparation is very simple and yet you will feel rewarded when serving this bright red dish. We named it after my favourite lipstick shade by MAC, Ruby Woo. First heat the oil. When hot add the coriander and the cumin. When they start darkening add onions and garlic. Always stirring add the vegetables in the following order: potatoes, beetroot, cauliflower. Then add the water. Let it simmer (about 10 minutes), then add the coconut cream and the red bell pepper. Let it simmer so that the flavours combine (about 15 minutes). Then check if all the vegetables are fully cooked and it's ready to serve. Add salt to taste. For decoration and fresh flavour mint leaves, basil or lemon balm work perfectly. Add those just before serving and be careful that the dish is not to hot, because the herbs will blacken.